For those who are newer to the iPad, or who just haven’t had a need to know this before, this very quick tip let’s you know how to take a screenshot (an image that captures what is currently on the screen) on the iPad and iPad 2. And happily, it’s very easy to do. You just press the Power (or sleep/wake) button at the top right of the iPad app and the Home button at the same time for just a quick second. When you do you’ll see the screen flash white for a moment and you’ll hear the camera shutter sound. Wow! Thanks! 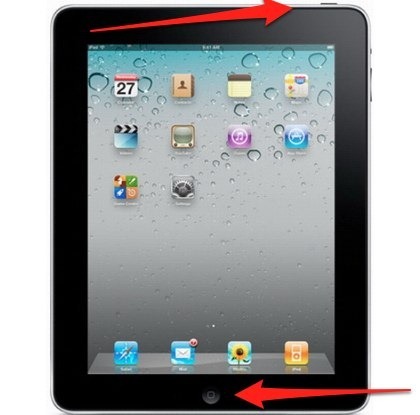 Great little trick that I never knew about, even after owning my ipad2 for 4 months! (and I *thought* I read the manual from cover to cover!). Any more little hidden tricks? Thanks! I actually needed this information for my dissertation and I’m glad it’s so easy to do! Thanks a lot. Your tips are easy to learn. If you look at the image at the top of this post, there the ones indicated by the arrows. So simple and so cool – thank you! Ty, so simple yet if you don’t know….you just don’t know it. And very useful extra tip at the end. Thank You & keep up the good work. Thanks for the wonderful tip – used it all weekend for user guide I was writing! Do you know who does training for building, servicing, infrastructure, etc of mobile technology? Thanks so much, especially the last part about cropping photos. Just used this feature to take a screenshot from the Map app so I can access ithe route offline. This is so great to know. Thanks for the explanation!